Shri Veda Bharathi, a Public Charitable Trust in India dedicated for research in Vedas and Sanskrit, as part of its mega project of Preservation and propagation of Vedic wisdom as brought out an audio DVD containing more than 10 thousand mantras from the Rig Veda. 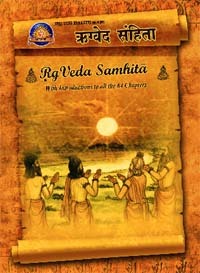 The Rg Veda DVD is priced at Rs 500/- in India and ad US$ 50/- in other countries. The DVD contains the traditional chanting, by an authoritative Vedic scholar, of the entire Rigveda Samhita, which is the most voluminous part of the sacred Vedic literature. It has audio files of all the 10,552 mantras, belonging to the 1028 Suktas of Sakala branch of Rigveda, distributed under 64 chapters/ Adhyayas. The DVD starts with a prayer highlighting the glory of Rigveda. This is followed by an introduction narrating the status of Vedic literature and the need for preservation and propagation of Vedic knowledge. The DVD further contains chapter wise introductions, for all the 64 chapters of Rigveda, and provides encyclopedia information like details of Ashtakas, Adhyayas, Mandalas, Suktas, Rishis, Devatas and Chandas before the commencement of the chantings of each chapter. The particular type of rendering in this DVD is referred to as Moolam or Samhita mode of chanting. A Guide is also supplied along with the DVD. With the help of index key parameters provided and file formats described therein, the audio tracks of any Sukta of Rigveda in the DVD can be located instantaneously and the contents can be accessed randomly. This in fact proves to be a powerful tool and saves the user time significantly. You can find more details about the Rig Veda chanting in DVD here at the official website of Shri Veda Bharathi.